A beautiful new addition to Jean Patrique’s knife range, the English Walnut 5 Piece Set come with a universal matching block, for easy storage and attractive presentation on your kitchen worktop. Featuring English walnut stained ergonomic handles for precision cutting, comfortable for even prolonged periods of use. This collection is made out of the finest stainless steel blades with a unique non-stick coating that resists stains, abrasions and high temperatures up to 220°C. Our universal block is the most hygienic way to store your knives. To clean - simply tip to release the universal rods, clean with warm soapy water and hand dry. Includes: 8” Precision Slicing Knife, 8” Bread Knife, 8” Chef’s Knife, 5” Utility Knife and 3.5” Paring Knife. 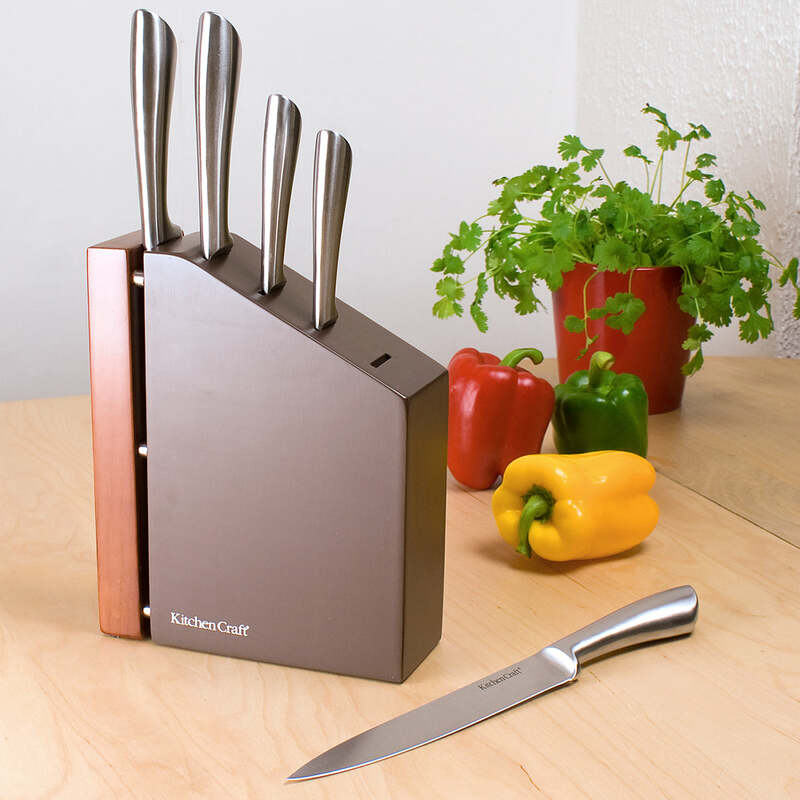 5 ESSENTIAL KITCHEN KNIVES - English Walnut Collection 5 Piece Knife Set with Universal Block includes an 8” Precision Slicing Knife, an 8” Bread Knife, an 8” Chef’s Knife, a 5” Utility Knife and a 3.5” Paring Knife. MATCHING UNIVERSAL WALNUT BLOCK – For easy storage and attractive presentation. Also the most hygenic way to store your knives, being super easy to clean. ERGONOMIC HANDLES – Ergonomic handles for precision cutting, comfortable even for prolonged periods of use. 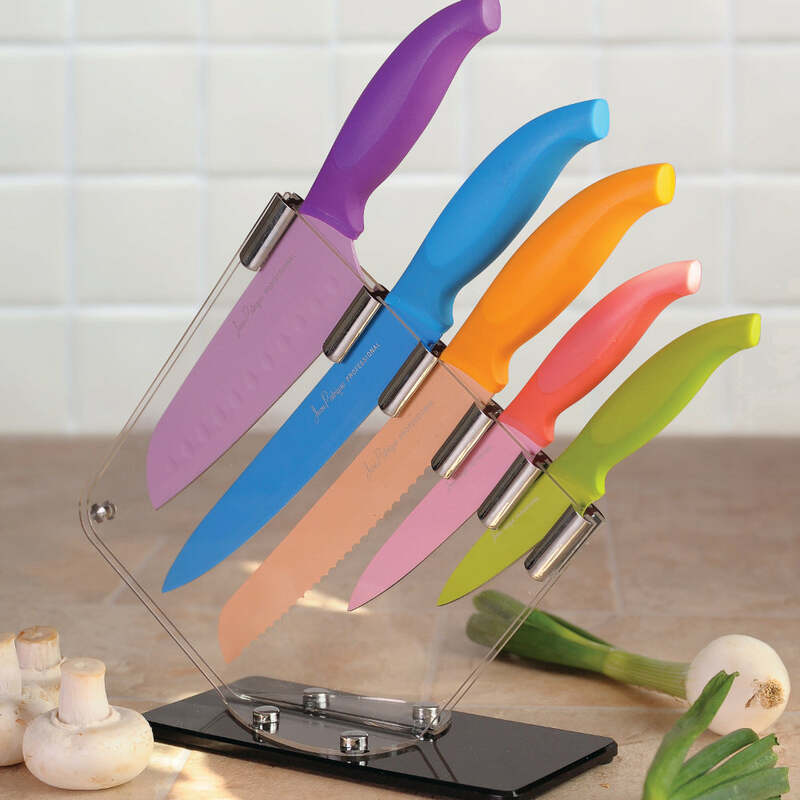 CUT THROUGH ANYTHING – The blades on these knives can cut through any texture - dense vegetables, thick-skinned fruits such as melon and honeydew, firm textured cheese, tough cuts of meat and delicate fresh fish. NON-STICK – Non-stick coating that resists stains, abrasions and high temperatures up to 220°C.